Why are we getting repeated Google searches for "removing pachysandra"? 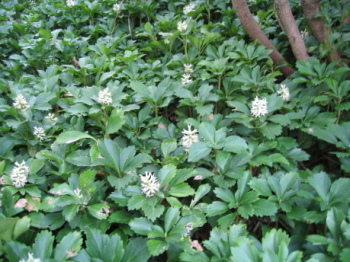 We have never posted on that subject, although I guess we have posted on pachysandra. Since there appears to be interest out there, here's my method. I am an expert at pachysandra removal. You take a good sharp spade - not a shovel - and with it cut deep parallel lines in the pachysandra bed, about 14" apart. Then you use the spade to cut those stretches into 2-3' lengths.�Use the spade to begin to undercut those�strips a couple of inches deep, and then you can peel the whole thing up like a slice of carpet. If you want to replant it somewhere else, just lay those lengths of carpet down, and, with some watering, they will grow in. It's a good time of year to re-link our past piece on Removing�Pachysandra, that durable shade�ground cover which is ubiquitous in these parts and which can be pleasant in the right place, but vulgar, I think, in others. Of course, you can just run the mower over it all, and hope for the best. I'd rather have groundcover than grass, though I prefer English ivy to pachysandra. How do I limit the spread of pachysandra. I am happy with it under two holly trees, but, it is starting to spread ino our lawn..